Whenever i am trying to play .avi file on my Galaxy Y, system giving me message that unsupported file, can't play. So there should be an alternative way to play this kind of file. How to play .avi videos on my android phone. Need Help !! M8 ur stock video player does not support .avi file maybe some codec missing.Simple solution is go to play store and download mxplayer app.It's free and play's all video files format.Have fun. Your stock hardware cant support .avi video. but dont worry there are apps that run .avi file using software decoder. following are music player apps that run .avi file. 2)MX Video Player(dont forget codec). YOUR HARDWARE STOCK UNABLES TO PLAY .avi FILE IN YOUR SAMSUNG GALAXY TAB. BUT DON'T WORRY THERE ARE MANY APPLICATION WHICH HELPS YOU TO PLAY .avi FILE . BUT AMONG THEM THE BEST ONE I THINK IS MX PLAYER , IT HELPS YOU NOT ONLY TO PLAY .avi FILE BUT ALSO DVDRip , .mkv & MANY OTHER FILE . All the video formats are not supported by android phones. If u have any one of the following Players then u can play this type of formats. there are also some video converters available. By using this video converters u can convert the .avi format to other formats supported by galaxy Y. Thus u can get rid of this problem. Some of the apps recommended to play avi videos are: HD video player,Movie Player Vista,VLC player,ROCK player,Mobo Player,AVI movie player,Moai FLV player..
- - > That's it. I will help you to solve your problem don't worry just follow as i say. 1.You cannot play all formats of videos on your mobile . 2.You need to install other player to play the different formats of videos. 4.You can download these softwares from Google play store. The .avi files not playing due to .avi files unsupported for your device. So,convert this .avi files to supported files and then play the video now. 1. Download the total video converter application for converting the video to other supported file. 2. After downloading install the download file. 3. After installation tap the installed application. 4. Now add the .avi file to this total video converter. 5. After adding not choose the required output file name like MP4 ,3GP or FLV etc. 6. Finally tap the convert option. Now you can view the .avi file in your device. And Samsung Not Supported The AVI Format So That Is Easily Solution To Download The Any Other Player. I am sorry to say that your phone doesn't support .avi files, instead of that you can play mp4 videos. To get rid from this problem you can install "MX VIDEO PLAYER". This video player will enable you to play almost all the formats and you can also play HD Format with the help of decoding provided in that application. IF you are unable to play .avi file extension on your device you can download a .avi extension players from google play. The most famous and free app which works very well with all android phone is the MX Player which you can download by searching it on google play. The stock player on your device is not compatible with many formats. Its lacks codecs and necessary hardware support to play certain videos. So you must have to use third party video players to do so. Download only from Play store. Avoid other sites. I have the right solution for your problem,don't worry just follow my steps. At the first you need to know that your mobile is supported to play many formats of videos and it can also play the .avi file . But these are not supported to play with the default player which comes with the phone. If you want to play those videos you need to install the third party apps such as. Hope it is helpful to you. All types of videos cannot be played by Samsung Galaxy Y.
Dear friend, i am sorry to inform you that in your samsung galaxy y only following files are supported. So you can not directly play avi files directly. For that you should have higher players like real player,gom player,vlc player,hd player etc. So try to install one of these players. Here i have two method's for you to play video's of .avi format. 1.You can convert video's to supportable format first and then transfer them to your device. You will get video converter's on internet easily.Total video converter & Any video converter is best among all. 2.You can download video running Application/Utilities in your device so that they make's your video to run in your device. my dear friend you won't be able to play avi files directly in your phone's browser as they are not supported by it. but you can use some higher players for them like vlc player,hd player,gom player,mx player,mobo player. so install any one of them and enjoy avi files. Do not worry, you just need to download any of these video players from play store to get your problem resolved. I think that there is no suitable media player that is compatible to the .avi video on your device. So my suggestion to you is that you should have to convert the files to a format that is suitable to the media player that you are using on your device. Hello My dear Dude ..
You need to download the another player to run the .avi video file..
you can download the wmv player, vlc media player, real player to run the video..
Hello sir,Samsung galaxy Y do not play due to sofwere problem so firstly you uninstall app in your phone and after sometime install it after that your problem not solved then you other app download like ***HD PLAYER***MX PLAYER***VLC PLAYER***FLASH PLAYERHOPE IT HELP YOUGOOD LUCK!!!!!!! ~~~ Transfer the .avi songs to computer. ~~~ Launch the video converter application like total video converter. ~~~ Tap the add option and upload the .avi video to this. ~~~ Now choose the samsung galaxy y support format. ~~~ Now move the convert file to samsung and play. Don't worry, this problem is arising before you because of compatibility issue. .avi is not supported by Default Player of Samsung Galaxy Y, so you have to download and install some other good payer. You can download it from https://play.google.com/store/apps/d...tav7neon&hl=en. It is the best media player any plays all kind of formats. It is also very good player and also support all type of formats. You can download it from https://play.google.com/store/apps/d...e=related_apps. You can download it from https://play.google.com/store/apps/d...alPlayer&hl=en. You can download it from https://play.google.com/store/apps/d...roid.nil&hl=en. These all Media Players are available on Google Play Store at free of cost. My apologies to express that your particular mobile phone would not help .avi documents, in lieu of that you can engage in mp4 videos. To have rid out of this challenge it is possible to install "MX VIDEO PLAYER ".This online video player is going to help you to engage in almost all the codecs and you could as well engage in HD File format through decoding given for the reason that application. *********Firstly it is not the problem with your Samsung phone. *********You are not able to play the videos because the default player of your phone. *********Your phone supports that formats of videos to be played. *********In order to play those videos you will need to download and install some third party apps from play store. *********Here are some of the best video players available in Play store. As you said that you are unable to play the .avi video file in your device..
>>might be possible that the default media player does not support this file fromat..
To play .avi file format download other media player as..
For this you have to..
>>go to google play store..
>>download the latest version and install it in your device.. Your problem will be resolved.. 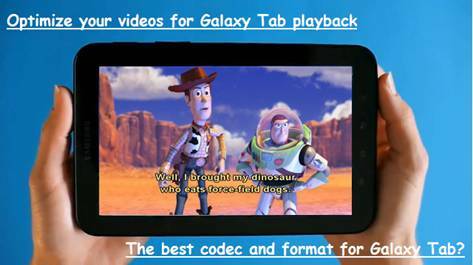 Does Samsung Galaxy Tab 10.1 supports the .flac audio and .mkv video formats? All times are GMT +5.5. The time now is 04:47 PM.